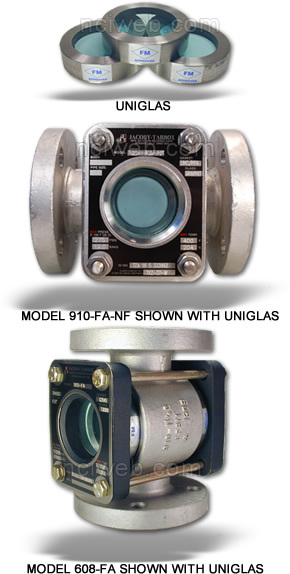 UniGlas Sight Windows and UniGlas Sight Flow Indicators enjoy wide­spread application throughout major industries: chemical, pharmaceutical, food & beverage, nuclear, biological, mining, electrical and general manufacturing/fabricating. Windows and Indicators are installed in conjunction with tanks, vessels, autoclaves, pipelines, vacuum components, compressors, pumps, filters and other related equipment. Jacoby-Tarbox UniGlas products are manufactured for both new and retrofit installations. The high pressure and high vacuum capabilities of UniGlas allow applications not previously possible with conventional glass, either annealed or tempered. Standard UniGlas applications serve pressures up to ASME Class 600. Special discs are available to serve pressures to 10,000 PSI (690 bar) depending on dimensions and temperature. Vacuum tightness of glass-to-metal fusion: < 10 - a Torr. 1 Sec. For extraordinary applications involving toxic or otherwise dangerous materials. Uniglas discs can be installed back-to-back, doubling already increased safety and strength factors. Dual Uniglas is available for both retrofit and new applications. Wherever installed, either as a sight window or in sight flow indicators. Dual Uniglas provides a "back up" disc to maintain pressure in the event of system malfunctions. Some sight glass is pre-stressed, by surface treatment, to reduce the effects of bowing under high pressures. However, this glass becomes more vulnerable to impact shattering and edge chipping. In Uniglas discs, the glass assumes improved properties following processing. 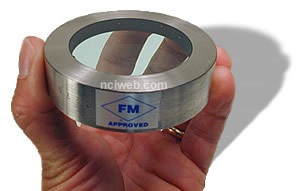 While the metal ring "shrinks" around the glass, compressive forces create a stronger sight window glass, more resistant to the effect of scratching, chipping, and surface pitting. From the beginning, designers have relied on glass and steel to make the small. strong windows that can show you what's happening inside your system's pipes, tanks and vessels. Through these precisely engineered ports, you can check the speed, volume, viscosity, mix, color and other tell­tale flow characteristics of gases, liquids and solids. Unfortunately, these windows have forever been lacking in one functional way or another. The glass scratches or chips too much. Designs using glass layers are too thick. bulky. Packings and adjusting screws and shims add to parts inventories. Steel and glass expand differently at elevated temperatures, inviting burst failure. Corrosive liquids or gases simply eat windows away. Pre-stressed glass suddenly shatters when smacked by solid materials. So it has been a long struggle, trying to make a sight window that will tolerate closed chambers by dramatically resisting high pressures, thermal influences. chemical attack and mechanical forces. Plus resist all that for a long time, safely, cost-effectively. The outer ring of the UniGlas disc is machined from carbon steel or Hastelloy C. The specific grades of these metals are extraordinary, relative to their significantly lower thermal expansion coefficients. The glass component of the UniGlas disc is an exceptional material as well. The hybrid glass formula is equivalent to the material used in glass lined reactors. (1) high resistance to damage from both alkalis and acids: (2) resistance to steam wear and erosion: and, critically important, (3) a coefficient of thermal expansion compatible with that of the metal outer ring. Combining these specific metal and glass materials allows UniGlas discs to expand as one component in response to even extreme temperature and pressure variables. This harmony under stress allows unprecedented sight window glass strength, structural soundness, and safety. All UniGlas discs are manufactured under continuous control of highly experienced and expertly trained personnel. Discs are processed in batches, with each batch subjected to a program of carefully calculated tests. As an example, each disc is visually tested for proper materials fusion. Viewed perpendicularly under polarized light, each glass surface must show several concentric lines at the edge (isochromatics) which are highly serrated near the ring. You May Have UniGlas® Most Any Way You Want It. In new Jacoby Tarbox equipment or As Retrofits. Applications for UniGlas sight , windows are the same as for any sight window. They can provide higher standards of safety and strength for viewing inside tanks, vessels, pipes and other chambers, under gas-tight and liquid-tight conditions, in all major manufacturing and processing industries. Performance characteristics vary, depending on the specific sight window style and whether the UniGlas disc ring is constructed of stainless steel or carbon steel. UniGlas sight windows are available as large as 12" in diameter. UniGlas Sight Windows Individual units, in a variety of sizes and styles, are available for direct connection to vessels or other chambers. 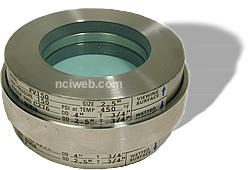 These UniGlas sight windows consist of four pieces: (1) the UniGlas disc; (2) the installation flange; (3) a sealing gasket: and (4) a cushion gasket. On-site installations are simple, quick, and require no adjustments. Jacoby-Tarbox Sight Flow Indicators With UniGlas Discs A wide selection of Jacoby-Tarbox sight flow indicators is available with UniGlas discs. Styles include plain, rotary. flapper, drip and ball types for service in a wide range of pressures and temperatures. Threaded, flanged, 90°, jacketed, lined and special-purpose indicators are included. For extraordinary applications involving toxic or otherwise dangerous materials, UniGlas discs can be installed back-to-back, doubling already increased safety and strength factors. Dual UniGlas is available for both retrofit and new applications. Wherever installed, either as a sight window or in sight flow indicators, Dual UniGlas provides a "back-up"disc to maintain pressure in the event of system malfunctions. 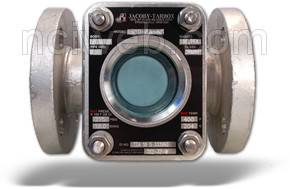 NOTE: Standard models of most Jacoby-Tarbox sight windows and sight flow indicators are filled with an all-glass borosilicate window which is held in place by separate metal flanges. These standard products are readily available with UniGlas discs. Also, Uniglas discs can easily be retrofitted to Jacoby-Tarbox and other brand products now in service.